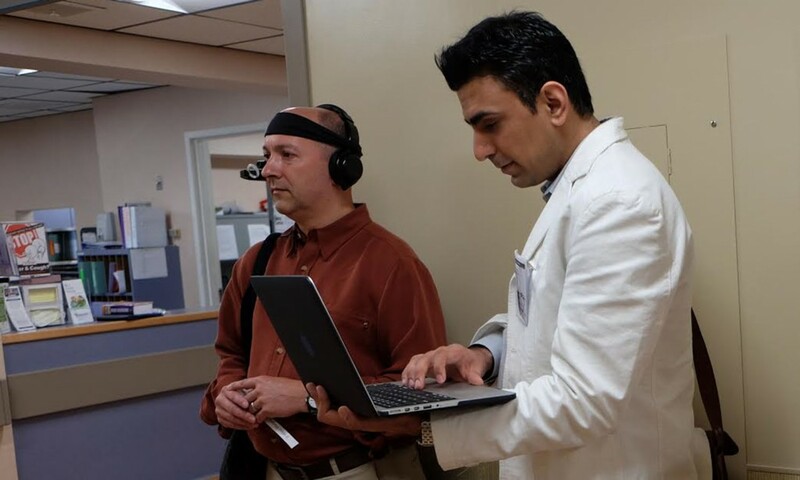 CSUN professor Hessam Ghamari (right) works with a volunteer (left) to explore neuro-imaging technologies that examine the environmental landmarks that draw in our eye and attention as we navigate a space. Photo courtesy of Hessam Ghamari. Have you ever been to a new place — whether a building at school, a shopping mall or a hospital — and gotten lost or disoriented somewhere along the way? California State University, Northridge professor of interior design Hessam Ghamari explores this very sensation by examining the impact of the environment on our health and well-being through the use of evidence-based technology. These technologies examine where we look, what we ignore and what grabs our focus when we’re at a new location. 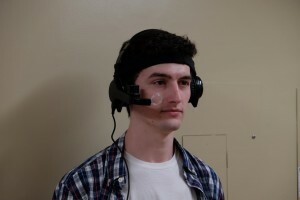 Student wears neuro-imaging gear for environmental psychology testing. Photo courtesy of Hessam Ghamari. Ghamari is on a quest to harness concepts in interior design to improve individuals’ ability to “wayfind” in unfamiliar places. 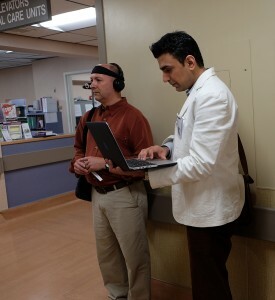 Ghamari said he hopes to ease this wayfinding process not just for students, shoppers and patients, but in particular for people battling dementia or Alzheimer’s disease, who often forget where they are and have been due to memory loss. Through his research, Ghamari has found that health care facilities can improve the lives of dementia patients by implementing certain architectural and interior design elements. One way to improve a patient with dementia’s ability to find their way is fairly straight-forward: Provide a layout with little directional change, such as a simple, straight corridor or an L-shaped corridor, rather than a more complex layout, Ghamari explained. This streamlines pathways. In addition, specific, distinguishing colors for residents’ doors and rooms in an assisted-care or memory-care facility can also help to enhance orientation. Similarly, unique furnishings or items that provide architectural differentiation aid in a patient with dementia’s ability to determine which room is theirs, the professor noted. 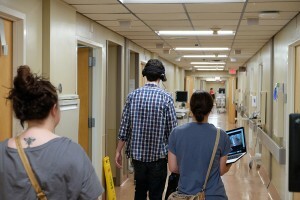 Interior design students use neuro-imaging technology in order to study ways that may improve health and well-being through interior design. Photo courtesy of Hessam Ghamari. Ghamari also has found that placing a display case or shadow box that includes personal memorabilia outside an individual’s door can drastically improve their ability to locate their room in a facility, because seeing their personal touchstone pieces can help guide them to their living quarters. Moreover, bright, even, glare-free lighting is best, since it reduces depression and improves mood, as does adding natural light (with a skylight or windows) in the rooms of dementia patients, he said. Ghamari encourages his students to incorporate evidence-based research, such as the environmental psychology he explores, into their studies as well. If interior designers were to use these techniques and concepts, their work could enhance and improve the well-being of their clients, he said. “Since I began working at CSUN last fall, I have been having a lot of conversations with my students — both last semester and this semester — about research-based design,” Ghamari said.